If you become pregnant, one of the first tests your doctor will order is a blood test. This test will determine whether you are Rh positive or Rh negative. This is important to know because it can affect your growing baby’s health. What does Rh positive or negative mean? Rh is a specific type of antigen located on people’s red blood cells. Just as blood is typed A, B, AB, or O, blood is also typed as positive or negative. The positive or negative refers is your Rh factor, and indicates whether or not you have Rh proteins on your red blood cells. If you carry the Rh proteins, you are Rh positive. If you don’t carry them, you are Rh negative. You inherited your Rh factor from your parents, and about 85% of people are Rh positive. Being Rh positive or Rh negative does not affect your health. Why should I care about my Rh factor? 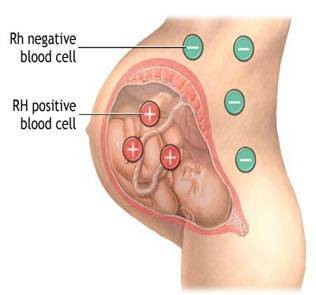 If you are Rh negative, but your partner is Rh positive, there’s a 50% chance that your baby is Rh positive as well. This presents Rh incompatibility, where your red blood cells carry different proteins than your baby’s. Therefore, it’s important to know the mother’s blood type because if she is Rh negative, certain steps need to be taken to avoid health problems for current and future pregnancies. What does this mean for my baby? Rh incompatibility can present health problems for your baby, but only if the woman has been pregnant with an Rh-positive baby before. This may seem confusing, but stay with us. You see, when an Rh-negative woman is first pregnant with an Rh-positive baby, the baby’s blood can cross into the mother’s bloodstream. Once the mother’s blood detects the Rh-positive blood from the fetus, it doesn’t recognize it, views it as a foreign invader, and creates antibodies to lyse the Rh-positive cells. Once a woman has developed the antibodies against the Rh protein, she has been sensitized. The crossing of the baby’s blood into the mother’s blood typically happens during labor. It can also happen during pregnancy and miscarriage, though it’s uncommon. Therefore, the first time a woman is pregnant with an Rh positive baby, her body will not know until childbirth, and by then the baby has been delivered so no threats are posed. The second time a woman is positive with an Rh-positive baby, however, her body already has the antibodies against Rh-positive blood cells. These antibodies can cross the placenta and attack her baby’s red blood cells, leading to hemolytic disease of the newborn. In this condition, the baby’s red blood cells are destroyed faster than they are created, causing a lack of oxygen for the baby. This can lead to serious problems and can even be fatal. The good news is, however, that with proper prenatal care this can be avoided. It is important to see your doctor as soon as you are pregnant to screen for Rh incompatibility. Your doctor can prescribe treatments that will prevent hemolytic disease of the newborn. One of these treatments is known as Rhogam, and it is a medicine that prevents your body from making Rh antibodies even when you are exposed to Rh-positive blood. This is almost always given to Rh-negative mothers at childbirth to prevent the accumulation of Rh antibodies. Are you newly pregnant and need proper prenatal care? Dr. Morice is an OB/GYN in Morgan City, Louisiana. Him and his staff provide top-notch care to you and your growing family. For more information, contact his office at (985) 702-BABY or drmorice@mybabydoc.com. What is Post Tubal Ligation Syndrome (PTLS)?